In loving memory of our wonderful father, grandfather and great grandfather who passed away 21 March 2019, aged 93 years. Sadly missed by daughters Gill, Penny and their families. A grand gentleman loved by all who knew him. 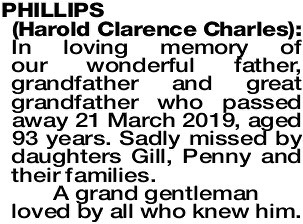 The Funeral Cortege for Mr Harold (Clarrie) Phillips formerly of Peppermint Grove will arrive at the main entrance of KARRAKATTA Cemetery, Railway Road, Karrakatta at 11.00am on THURSDAY (04.04.2019) for a Cremation Service in the Brown Chapel. 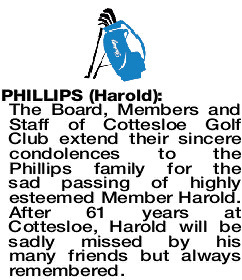 The Board, Members and Staff of Cottesloe Golf Club extend their sincere condolences to the Phillips family for the sad passing of highly esteemed Member Harold. 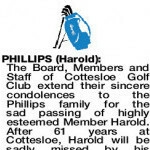 After 61 years at Cottesloe, Harold will be sadly missed by his many friends but always remembered. Deepest sympathy to Gill, Penny and their families on the passing of our much loved friend. Alas, the music has now stopped! 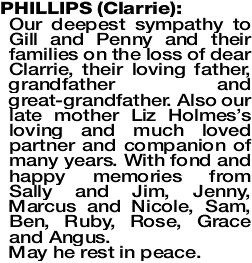 PHILLIPS CLARRIE Our deepest sympathy to Gill and Penny and their families on the loss of dear Clarrie, their loving father, grandfather and great-grandfather. 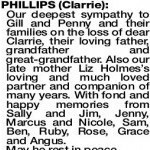 Also our late mother Liz Holmes's loving and much loved partner and companion of many years. With fond and happy memories from Sally and Jim, Jenny, Marcus and Nicole, Sam, Ben, Ruby, Rose, Grace and Angus.